First Saturdays for Families: Let’s trade! We trade things all the time—from baseball cards, to secrets and music, to favors. Sometimes we exchange things or services we cannot do ourselves, as is the case with Time Divisa by José Antonio Vega Macotela, where he exchanges his time with prisoners in a Mexico City jail. Through these exchanges Vega Macotela asks: What can I do for you that you cannot do for yourself? How can your creativity produce original objects and drawings? Discover what we can do for each other and exchange ideas at the New Museum. This week’s activities include making and trading messages, experimental dances, poems, and paper sculptures. This New Museum First Saturday was developed in collaboration with Nicolás Paris as part of his Museum as Hub residency. This New Museum First Saturday is presented as part of the New Museum’s 2012 Triennial: “The Ungovernables,” an exhibition of work by thirty-four artists, artists groups, and temporary collectives born between the mid-1970s and the mid-1980s, many of whom have never before exhibited in the US. New Museum First Saturdays for Families are free of charge. This program is designed and recommended for families with children aged between four and fifteen years and includes free New Museum admission for up to two adults per family. Children under eighteen are always admitted free. No preregistration is required. Space is limited and tickets are given out on a first-come, first-served basis. Your entire party must be present; tickets will not be given to partial parties. “The Generational” is made possible by a generous grant from The Andy Warhol Foundation for the Visual Arts. Additional support is provided by the Jacques and Natasha Gelman Trust, the Horace W. Goldsmith Foundation, and the Fundación Almine y Bernard Ruiz-Picasso para el Arte. Major support is provided by the Friends of “The Generational” co-chaired by Shelley Fox Aarons, Toby Devan Lewis, and Lonti Ebers. The Steering Committee of the Friends of “The Generational”: The Booth Heritage Foundation Inc.; Ellyn and Saul Dennison; Mitzi and Warren Eisenberg; Susan and Leonard Feinstein; María José Garcés; Carol and Arthur A. Goldberg; Sunny and Brad Goldberg; Lietta and Dakis Joannou; Tina Kim and Jaewoong Chung; Ken Kuchin; Sueyun Locks; Shaun Caley Regen; Lyndley and Samuel Schwab; Eve Steele and Peter Gelles; and Laurie and David Wolfert. Friends of “The Generational”: Lorenzo Martone; Kathleen O’Grady; Ana Sokoloff; and Rosina Lee Yue and Bert A. Lies, Jr.
Special thanks to the Artist Steering Committee of “The Generational”: Mark Bradford, Michael Joo, Damián Ortega, Lorna Simpson, Rirkrit Tiravanija, Kara Walker, and Haegue Yang. Support for the accompanying publications is made possible by the J. McSweeney and G. Mills Publications Fund at the New Museum, and a grant from the Elizabeth Firestone Graham Foundation. Curatorial travel and research has been underwritten by The Andy Warhol Foundation for the Visual Arts and the Asian Cultural Council. Artist travel and production support is provided by the Embassy of Colombia, Washington D.C., Consulate General of Brazil in New York, the Danish Arts Council, the Mexican Cultural Institute of New York, and the Office of Cultural Affairs, Consulate General of Israel in NY. Art shipping is provided, in part, by the Mexican Ministry of Foreign Affairs. The official hotel partner for “The Generational” is The Standard Hotel. Translation support was generously provided by Akio Aoki. The Museum as Hub Residency Program is made possible by the lead support of the Rockefeller Foundation. Artist travel is supported, in part, by a grant from the Ford Foundation. Additional generous support for the Residency Program is provided by Laurie Wolfert. Public Movement’s participation is co-presented by the New Museum and Artis Contemporary Israeli Art Fund, with additional support from the Ostrovsky Family Fund, the Consulate General of Israel in New York, and the Israeli Lottery Fund. The Museum as Hub is made possible by the lead support of the Robert Sterling Clark Foundation. Museum as Hub and public programs are made possible, in part, through the support of the New York City Department of Cultural Affairs and the New York State Council on the Arts. Endowment support is provided by the Rockefeller Brothers Fund, the Skadden, Arps Education Programs Fund, and the William Randolph Hearst Endowed Fund for Education Programs at the New Museum. 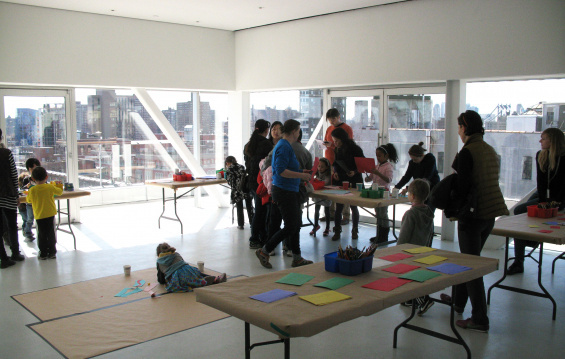 New Museum First Saturdays for Families are made possible, in part, by the New York City Department of Cultural Affairs and the New York State Council on the Arts. Additional generous support provided by the TD Charitable Foundation. Endowment support is provided by the Keith Haring Foundation School and Youth Programs Fund, the Rockefeller Brothers Fund, the Skadden, Arps Education Programs Fund, and the William Randolph Hearst Endowed Fund for Education Programs at the New Museum. Education and public programs are made possible by a generous grant from Goldman Sachs Gives at the recommendation of Hermine & David B. Heller.